Brad Davis of WRDC. The crowd was estimated at 125. Todd Feinburg of the 50,000-watt WTIC-AM tilted his head toward the Capitol and pronounced state government a “criminal enterprise” and its elected officials “assholes.” Steve Noxon of the smaller WATR-AM in Waterbury said tolls were less about improving transportation than enriching Lamont’s friends on Wall Street. “I don’t know why there aren’t 50,000 people here today to protest the insanity of what’s going on,” Feinburg said, looking out at an audience that barely covered the wide sidewalk below the north steps. “The radio hosts have our back,” Visconti said. Visconti, who endorsed limited tolls during a campaign as a petitioning candidate for governor in 2014 and again as he briefly campaigned in 2018, acknowledged differing views among the protest movement. He said he was objecting to Lamont’s reneging on a promise to impose tolls only on truck traffic. “You have way more fans on the Democratic side than you know,” said Farricker, a former CT Lottery chairman under Gov. Dannel P. Malloy. Rob Blanchard of Lamont’s press staff stopped by to watch. 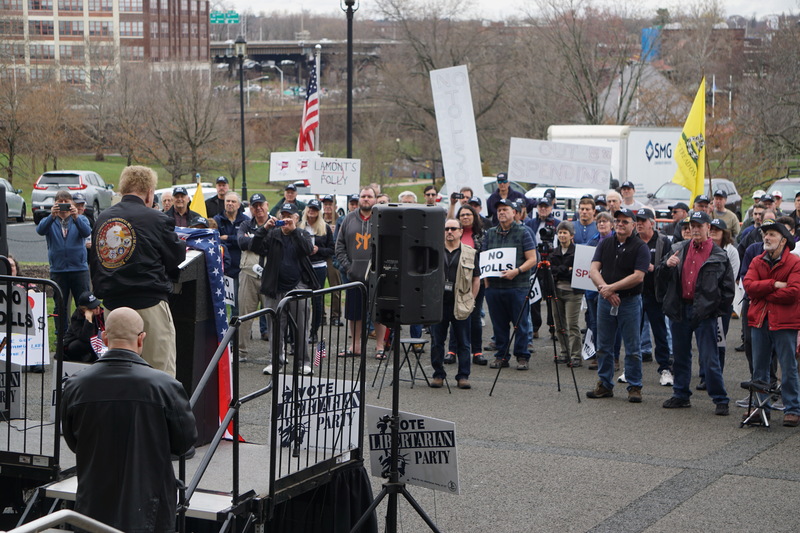 “The people who attended today’s rally aren’t saying no to tolls. They’re saying yes to taking out a $30 billion loan, as proposed by the Republicans, recklessly adding to the state’s deficits and requiring Connecticut taxpayers to foot 100 percent of the bill, plus interest,” Blanchard said. Blanchard was referring to a GOP alternative that calls for using the state’s current ability to borrow to finance transportation projects that are soon to be unaffordable, if only financed by the state’s fuel taxes and motor-vehicle fees. Lamont says tolls could raise $800 million annually, with 40 percent coming from out-of-state drivers. The state still would borrow for major projects, the debt service paid by tolls. But Saturday was not a day for debating the pros and cons of various plans to finance a transportation infrastructure that the governor’s GOP critics acknowledge is badly in need of maintenance and improvement. The talk-radio hosts say the issue is a fraud, a means by corrupt officials to ensure government can feed public-sector unions. Feinburg cast state government, especially the Democrats who have controlled the governor’s office for eight years and both chambers of the General Assembly for all but two of the past 32 years, as focused on providing services and programs that buy votes. “They’re buying the idea of ‘I vote for you, you give me something.’ And that’s working really well for the Democrats,” Feinburg said. He quickly riffed on proposals to raise the minimum wage to $15 and create a paid family medical leave program as the latest forms of pay to play.